Since a major eruption in 1994 that forced the complete evacuation of the nearby city of the same name, Rabaul Volcano on the island of New Britain has remained intermittently active. Rabaul is a large caldera volcano whose eastern rim has been breached and flooded by the sea. 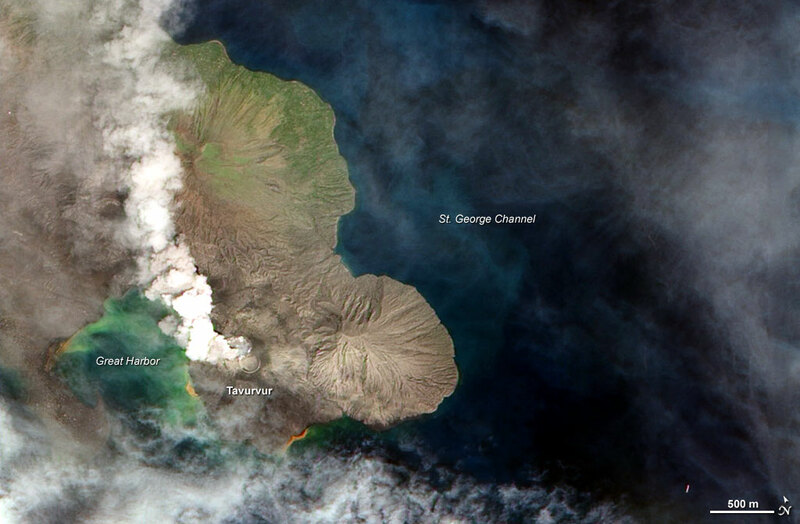 Numerous vents and cones occur around the rim, including Tavurvur Cone, which was erupting when this image was captured by the Advanced Land Imager on NASA’s Earth Observing-1 (EO-1) satellite on November 30, 2009. From November 20–26, strong eruptions from Tavurvur shot ash plumes 1.5 kilometers into the air above the summit and “showered the flanks with lava fragments that were incandescent at night,” according to a report from the Rabaul Volcano Observatory posted on the Smithsonian Global Volcanism Website. A caldera volcano forms when a massive eruption empties the magma chamber underlying the volcano; the overlying rock and debris sink into the chamber, leaving a crater at the surface. The eruptions that formed Rabaul Caldera took place as recently as 3,500 and 1,400 years ago. The 1994 eruption that buried Rabaul involved the currently active Tavurvur Cone as well as Vulcan Cone, located across Blanche Bay to the southwest (not pictured) The city of Rabaul is located on the peninsula across the Great Harbor from Tavurvur. More than a foot of ash fell on parts of the city, and combined with rain, it collapsed many of the small city’s buildings and houses. White dots on the peninsula may be buildings or building sites. Pompeii, with its ancient mosaics and buildings preserved by the volcanic eruption that buried the town, is one of the world’s most interesting destinations. But now you don’t need to board a plane to visit: It’s on Google Street View. Google has mainly focused its 360-degree panoramic service on major living-and-breathing cities around the world like New York, San Francisco, or Rome [USA Today]. But this week the service began to feature Pompeii, allowing people anywhere in the world to tour the ancient marvels on site. Italy’s culture ministry says it hopes the move will boost tourism to the site [BBC News]. The eruption of Mount Vesuvius buried Pompeii in 20 feet of ash in 79 A.D., killing everyone there and destroying other nearby towns like Herculaneum. The disaster, however, preserved much of the city until its rediscovery in the 1700s, giving archaeologists a window into 1st-century life in the Roman world. Pompeii isn’t the only historical site going live on Google Street View. Among the foreign sites appearing Thursday were Stonehenge, Prague, the ancient city of Caceres in Spain and famous windmills in the Dutch village of Kinderdijk-Elshout [ANSA]. Do you know volcanoes well? We often hear the term “IQ” (intelligence quotient) — but how would you rate your “VAQ” (volcano awareness quotient)? In other words, how well do you know the volcanoes in your backyard? Let’s begin with a short quiz. No need to flash back to high school and those feelings of panic—sweaty palms and racing heart rate — that set in when your teacher announced a pop quiz on the homework you forgot to do. This quiz won’t be scored by anyone other than you. Here are five questions to test your VAQ: How many active volcanoes are in the State of Hawaii? What is the most abundant gas emitted by Kilauea and other Hawaiian volcanoes? What is the longest known Kilauea eruption? During the past 200 years, how many times have Mauna Loa lava flows reached the ocean? How many earthquakes of magnitude 6 or greater have occurred on Hawai`i Island since 1900? The answers will be revealed later in this article. First, let us tell you about an upcoming and unparalleled opportunity to learn more about Hawaiian volcanoes — and increase your VAQ. As we usher in the New Year, Mayor Billy Kenoi will issue a Proclamation from the County of Hawaii, designating January 2010 as “Volcano Awareness Month.” Throughout the month, the USGS Hawaiian Volcano Observatory (HVO), in cooperation with Hawaii Volcanoes National Park, Hawaii County Civil Defense, and the University of Hawaii at Hilo, will sponsor various events to promote the importance of understanding and respecting the volcanoes on which we live. Volcano Awareness Month kicks off 10 a.m. Saturday, Jan. 2 with an opening event on the Jaggar Museum overlook in Hawaii Volcanoes National Park. The public is invited to attend. Kenoi has been invited to read the Proclamation, and featured speakers will include “Thomas A. Jaggar,” HVO’s founder and first Director (portrayed by Peter Charlot), and Jim Kauahikaua, HVO’s current Scientist-in-Charge. Cindy Orlando, Superintendent of Hawaii Volcanoes National Park, Quince Mento, Administrator of Hawaii County Civil Defense, and other special guests will also address volcano awareness. This opening is just the first of a month-long series of events focusing on Hawaiian volcanoes. They include guided hikes, evening talks, teacher workshops and other extraordinary programs. In order to reach a wide audience, they are scheduled on weekdays, as well as weekends. Many of the programs and activities will be held in Hawaii Volcanoes National Park, but some will also take place in Hilo and in Kona. HVO selected January 2010 as Volcano Awareness Month, largely because Jan. 3, 2010, marks the 27th anniversary of Kilauea’s ongoing east rift zone eruption. It will also be 20 years since Kalapana was buried beneath lava and 50 years since Kapoho was inundated by fast-moving lava flows. The destruction of these two communities is a sobering reminder of why it’s important to understand how Hawaii’s volcanoes work. Now, back to the quiz. The answers, in order of the questions asked, are as follows. There are six active volcanoes (defined as erupting in the past 10,000 years) in the State of Hawaii. Water vapor is the most abundant gas released by Hawaiian volcanoes, followed by carbon dioxide (CO2) and sulfur dioxide (SO2). The Ailaau eruption, which lasted about 60 years from around 1410 to 1470, is Kilauea’s longest known eruption. Eight Mauna Loa lava flows, from eruptions in 1868, 1887, 1919, 1926, 1950, and 1959, have reached the ocean in the last 200 years. Since 1900, there have been 13 magnitude-6 or greater earthquakes—in 1929, 1941, 1950, 1951, 1952, 1954, 1962, 1973, 1975, 1983, 1989, and 2006. Even if you aced the quiz—and especially if you did not—we encourage you to participate in Volcano Awareness Month events to learn more about Hawaii’s volcanoes. Don’t be caught with a low “volcano awareness quotient” if the volcano in your backyard erupts! Passengers onboard the plane, which was flying from Kinshasa to Goma, warned the crew of heavy clouds before the incident, United Nations-run Radio Okapi reports. The flight, carrying 117 passengers, was operated by Compagnie Africaine d'Aviation, the Associated Press reports. Lava has surrounded Goma’s airport since a volcanic eruption in 2002. A cargo plane hit the hardened lava on the airport runway in 2007, bursting into flames and killing at least eight people. Congo has experienced more fatal plane crashes than any other African country since 1945, the Aviation Safety Network says. The province of Albay started preparing food packs and emergency equipment, including standby vehicles, on Wednesday, for possible evacuation of some 26,178 families from areas near the Mayon volcano due to the increasing probability of an eruption. Mayon Volcano had two ash explosions early Wednesday and the Philippine Institute of Volcanology and Seismology (Phivolcs) said it could recommend raising the alert status on Mayon Volcano to level 3, because of persistent ash explosions that might lead to a hazardous type of eruption. Albay Governor Joey Salceda has instructed the Provincial Social Welfare and Development Office to continue repacking food items for possible preemptive evacuation that could last between one month (as in the case of the August-September 2006 event) to three months (as seen in prior eruptions). For evacuation are 7,946 families at Alert 3 and 26,178 families at Alert 4. "I have requested the Joint Armed Forces of the Philippines and the Philippine National Police Task Force Mayon to continually and strictly enforce checkpoints at strategic areas around the volcano to deter residents, particularly orchid gatherers and vegetable farmers, from entering the danger zones." Cedric Daep, the department head of the Albay Public Safety and Emergency Management Office (APSEMO) said the municipal, city and barangay (village) disaster coordinating councils concerned were immediately reactivated and instructed to convene in order to review their contingency plans and master lists of population exposed to risks; conduct sustained social mobilization and community preparedness though barangay assemblies or neighborhood meetings; and to coordinate with the Provincial Disaster Coordinating Council (PDCC) through the safety and emergency management office to collect additional early warning and communication equipment." Daep said he was awaiting word on the preemptive evacuation in Barangay Bañadero in Daraga town, especially those who had been relocated but had returned to the area for their crops. "The said barangay is about eight kilometers away from the crater but a certain portion of the village is found within the six-kilometer permanent danger zone with around 20 households. The evacuation center in Daraga is ready to accommodate these residents but we are awaiting the report from the Daraga MDCC," Daep said. public address systems for use by barangay (village) officials in mobilizing neighborhoods for evacuation. A PDCC advisory issued Wednesday noon instructed the residents, motorists and schoolchildren in the ashfall-affected areas (traditionally southwest areas like Camalig, Guinobatan, Daraga, Legazpi and Sto. Domingo and the newly affected north-northwest areas--including Ligao, Oas, Polangui and Libon) to protect themselves by covering their noses with damp cloth or handkerchief. Dr. Luis Mendoza, provincial health officer, told residents to use wet towels as protection from the ash or use masks, especially those with asthma and other respiratory illnesses. Aside from the ash explosions at 1:58 a.m. and 7:02 a.m. on Wednesday, a visible plume spawned by a sudden ash ejection was reported by motorists traveling along the Malabog-Salvacion Junction in Daraga, Albay at around 12:20 p.m. The volcano was only a few inches tall and its lava was pinkish but the bubbling demonstration was a favorite of many of the fourth-graders attending Science Days at Angelo State University. Joe Satterfield, an ASU Geology Department associate professor, and five graduate students last week demonstrated two types of volcanic eruptions with table-top models to groups of about 30 kids who rotated through the six morning sessions. “I expect to see some of you back here in eight years,” Satterfield said, taking the opportunity to start recruiting the mostly 10-year-old children. The decade-old Science Days program brings students from area elementary schools into the halls of ASU’s Cavness Science Building to experience chemistry, biochemistry, biology, geology, physics and math through hands-on experiences, said the program’s organizer, Nick Flynn, associate professor of biochemistry. About 700 fourth-graders will attend Science Days this month, which began last week and continues today and Thursday. Students from 10 of the 17 San Angelo Independent School District elementaries are scheduled to attend, as are students from Big Lake, Wall, Angelo Catholic School, San Angelo Christian Academy and the San Angelo Christian Home School Association. McGill student Hallie Walker also said she enjoyed the volcano demonstration in the day’s geology session. The taxidermy display in the mammal room is impressive. One long wall is hung with more than 22 mounted heads, many of them from exotic animals such as a giraffe head and neck (at least 8 feet tall), a water buffalo and a reindeer. Other walls are covered with horned and antlered skulls, while an elephant skull rests on a metal file cabinet. Loren Ammeran, an associate professor of biology, let the children a beaver pelt and showed them its identifying tail and teeth. She displayed a preserved black-and-white ruffed lemur. “Has anyone seen the movie ‘Madagascar’? Madagascar is a real place,” she said, explaining the lemur was a native of that island off the east coast of Africa. Ammeran, who has participated in Science Days for the past five years, said the children are always excited and full of questions. The reptile session, held in a crowded basement room smelling of formaldehyde, was not universally popular. Several students said they had to leave the room because of the odor. Madison Stewart, Hallie’s cousin and also a student at McGill, disagreed. Jason Strickland, the biology graduate student leading the reptile session, kept going with the 25-minute program. After all, for every child who left the room feeling sick, there were a dozen straining to get a closer look at the stubby arms on a giant salamander or a bullfrog big enough to fill a gallon jar. He carefully uncoiled a snake from another jar. The Herbarium, a spacious, well-lit room only a floor above the reptile collection, holds the university’s plant collection. Hollie Laqua, a graduate student for professor Bonnie Amos, the Herbarium’s curator, presided for Science Day, guiding the students in a discussion of such plant survival techniques as bullhorn acacia’s ant-infested spines and poison ivy’s rash-inducing chemical. Bowie Elementary School student Bethany Gates, after attending only two of the six morning sessions, said she had already learned something from the chemistry discussion in the hands-on session. “I learned that if you use a pentagon every time you draw a star, there’ll be another pentagon inside it,” she said. McGill’s Breanna and her classmate, Cassie Bagwell, also said the hands-on session was the best. “You got to look at eyeballs and cockroaches,” Breanna said. By far the most popular event of Science Days, however, is the afternoon Magic Show put on to demonstrate aspects of chemistry and physics. Kevin Boudreaux, chemistry instructor and ASU’s resident magician, said the show has been part of the Science Days program since the beginning. “The kids get a kick out of it, especially when anything burns or blows up,” Boudreaux said. The program drew screams and standing ovations, especially when “magician’s assistant” Shane Anderson put flame to anything. “I like to make things go boom,” the computer science major said. He is minoring in chemistry minor and, along with Tania Estrada, had volunteered to participate in the show. “We have to specifically choose things that look spectacular but are still safe,” Boudreaux said. “Don’t want to set off smoke alarms,” Estrada, a biochemistry major, said. The auditorium emptied and the children headed in scraggly lines for waiting school buses, marking the end of another ASU Science Day. An obscure tribal group from Mindanao arrived here over the weekend to hold a religious ritual near the slopes of Mt. Mayon volcano in a bid to invoke spirits to thwart a potential violent volcanic eruption. Datu Higyaman Naholag-ayan , the tribal governor from Bukidnon who will lead the prayer ritual with 400 tribesmen from various ethnic group will perform the religious rites to stop the 2,450 meters high volcano in Albay from erupting. Datu HOLag-ayan said the ritual will be held at the famous Cagsawa ruins where remnants of a church belfry stands in a village in Daraga town that was buried by lahar, rocks and other volcanic debris spewed by Mt. Mayon in 1814. Clad in their ethnic costume, the group intends to hold ritual prayers and offer animal sacrifices to ask unseen spirits to intercede and calm down the restive volcano listed in the world tourism map as the volcano with an almost perfect cone. The ritual will save the people of Albay from the wrath of any disaster be it volcanic eruption or even typhoons, earthquakes and other calamities, he pointed out. He however, said that the ritual is not an assurance that this would prevent the volcano erupting but this would make the people aware of the danger so that they may be prepared in the event the volcano erupts. The Datu said he believes that the volcano is no ordinary mountain but is a kingdom where people live and die. Albay Gov.Joey Salceda will lead thousands of people across the province to witness the colorful religious prayer rituals. The datu said there are 135 ethnic groups with 12 million members across the country. Bicol has 27,000 tribesmen spread over the provinces of Camarines Sur, Camarines Norte and Albay. As this developed, Mt. Mayon continues to show signs of restiveness, with 7 quakes jolting the volcano for the past 24 hours. Mt Mayon alert status remains at Alert Level 2, meaning the volcano is still on a state of unrest as it continue to spew ash with periodic explosions. Military and police personnel manning the 12 checkpoints surrounding the volcano will enforce the off limits regulation and strictly implement the 6 kilometer radius Permanent Danger Zone and the 7 km. extended danger zone (EDZ) on the southeast flank of the volcano due to the threat from sudden explosions and rockfalls from the upper slopes. Residents near active river channels and those areas perennially identified as lahar prone in the southeast sector should be on alert during heavy and prolonged rainfall. NASA's Mercury mission spacecraft, Messenger, is revolutionizing humanity's view of the first rock from the sun. And its primary science mission hasn't even started yet. During its third and final flyby of Mercury, NASA's Messenger has found minerals on the planet's surface that current models say shouldn't be there in such abundance. And it appears that the planet was volcanically active – explosively so – for far longer than current ideas about its geological history suggest. The flyby took place Sept. 29. Mission scientists unveiled highlights from the flyby during a press briefing Tuesday afternoon. Piecing together Mercury's story "is like reading a fine mystery novel by Dorothy Sayers or Agatha Christie," says Sean Solomon, the mission's lead scientist and a researcher at the Carnegie Institution of Washington's Department of Terrestrial Magnetism. The effort comes complete with clues that point to the story's denouement, as well as red herrings to throw a reader off track. Mercury is the smallest of the solar system's eight planets. And it's the oddest among the rocky planets. Its iron core comprises up to 70 percent of the planet's mass, making it the most dense planet in the solar system after Earth. Which brings up one of Mercury's red herrings. Previous studies have indicated that the planet's surface is made up mostly of silicate-based minerals. That's been considered odd, since the vast majority of the planet is taken up by an iron-titanium core, notes David Lawrence, another Messenger mission scientist. Then, during the first Mercury flyby on Jan. 14, 2008, Messenger detected unexpectedly high levels of iron and titanium in surface minerals, he says. Flyby No. 3 provided an opportunity to check those initial results. It found that the first measurements were no fluke; the planet really is covered virtually universally with iron and titanium oxides. That's more consistent with what you'd expect from a largely metallic planet like Mercury, Dr. Lawrence adds. But it calls current models of the planet's formation into question. To explain how a largely Ironman planet came to be covered with a largely silicate crust, some scientists had invoked a powerful impact early in the planet's history. This would have knocked away much of the planet's original iron-rich crust, leaving a thinner shell dominated by silicates. But now that the crust appears to be dominated by these metal oxides, the cosmic smackdown theory requires a hard second look. And that's just one of three broad groups of ideas scientists have considered to explain the now-debunked surface silicate. "This is a pretty exciting result for us," says Lawrence, a geochemist at Johns Hopkins University's Applied Physics Laboratory, which built and runs the desk-sized Messenger spacecraft. Red Herring No. 2? Previous observations suggested that Mercury became geologically dead very early in its 4.6 billion year history. Not so, according to images for the third flyby. Among the portraits: a 180-mile-wide basin with two concentric rims. The floor below the lowest rim cradles "some of the youngest volcanic floes," says Brett Denevi, an Arizona State University researcher and member of the Messenger science team. How young? The team estimates that the floes are around a billion years old – suggesting the planet was volcanically active far longer than previously thought. Moreover, features on the plains surrounding the basin suggest explosive eruptions – something that happens when the magma has a high gas content. That observation, in turn, could yield clues about the composition of the planet's interior. Launched on Aug. 3, 2004, the Messenger spacecraft is expected to begin orbiting Mercury on March 19, 2011. The $446-million mission is expected to last one Earth year. And researchers are eagerly awaiting its arrival. "We still have a long way to go to understand the full story line" on Mercury, says lead scientist Dr. Solomon. Click here to read more about the images captured by Messenger spacecraft's first flyby of Mercury. VOLCANIC activity may split the African continent in two owing to a recent geological crack in northeastern Ethiopia, researchers said today. The 60km split in the desolate Afar region, which was the result of two volcanic eruptions in September 2005, has enabled scientists to further examine the earth's tectonic movements, said a report published in the Geophysical Research Letters. "The significance of the finding is that a huge magnetic deformation can happen within a few days like in oceans," Atalay Arefe, an Ethiopia-based university professor who was part of the study, said. Researchers say faults and fissures, which normally occur deep down on the ocean floor, are the main processes by which continents gradually break off from each other. They cite Africa, which underwent a similar phase when it split from America millions of years ago. "Normally, such phenomena happens beneath the ocean, which is inaccessible, expensive and very difficult to make experiments. But in Afar, it's quite a natural laboratory for us to carry those out," Prof Atalay said. Prof Atalay, who was part of an international group of scientists who have been undertaking studies since the eruptions, said the event indicated what was likely to happen in the mainland. "The ocean's formation is happening slowly, likely to take a few million years. It will stretch from the Afar depression (straddling Ethiopia, Eritrea and Djibouti) down to Mozambique," he said. The Afar region, known for its salt mines and active volcanoes, is one of the lowest and hottest places on the planet. The massive eruption of the Thera volcano in the Aegean Sea more than 3,000 years ago produced killer waves that raced across hundreds of miles of the Eastern Mediterranean to inundate the area that is now Israel and probably other coastal sites, a team of scientists has found. The team, writing in the October issue of Geology, said the new evidence suggested that giant tsunamis from the catastrophic eruption hit “coastal sites across the Eastern Mediterranean littoral.” Tsunamis are giant waves that can crash into shore, rearrange the seabed, inundate vast areas of land and carry terrestrial material out to sea. The region at the time was home to rising civilizations in Crete, Cyprus, Egypt, Phoenicia and Turkey. For decades, scholars have suggested that the giant eruption, just 70 miles from Crete, might have brought about the mysterious collapse of Minoan civilization at the peak of its glory. The remnants of Thera’s eruption today make up a circular archipelago of volcanic Greek isles known as Santorini. Thera is thought to have erupted between 1630 and 1550 B.C., or the Late Bronze Age, a time when many human cultures made tools and weapons of bronze. Scholars say the tsunamis and dense clouds of volcanic ash from the eruption had cultural repercussions that rippled across the Eastern Mediterranean for decades, even centuries. The fall of Minoan civilization is usually dated to around 1450 B.C. Geologists judge the eruption as far more violent than the 1883 eruption of the volcanic island of Krakatoa in Indonesia, which killed more than 36,000. The five tsunami researchers came from Haifa University, in Israel; Hunter College, in New York City; McMaster University, in Canada; and the University of Hawaii. The team did its excavations off Caesarea, Israel, a coastal town dating from Roman and Byzantine days. The coastal region was only sparsely settled at the time of the Thera eruption, with no identifiable city. The team sank a half-dozen tubes into the offshore seabed and pulled up sediment cores for analysis. It looked for standard signs of tsunami upheaval, including pumice (the volcanic rock that solidifies from frothy lava), distinctive patterns of microfossils, cultural materials from human dwellings and well-rounded beach pebbles that seldom appear in deeper waters. Writing in Geology, a journal published by the Geological Society of America, the team reported finding evidence of three tsunamis — two historically documented ones dating to A.D. 115 and 551, and one from the time of the Thera eruption. The Thera tsunamis, the team wrote, left a signature layer in the seabed of well-rounded pebbles, distinctive patterns of mollusks and characteristic inclusions in rocky fragments all oriented in the same direction. The disturbed layer, up to 16 inches wide, came from a few feet below the seabed in waters up to 65 feet deep. This really is the land of fire and ice. While three major glaciers cover 15 per cent of the country, you can also get up close and personal with thermal vents as they roar their superheated sulphurous steam out through cracks in the ground. “It’s hot!” exclaimed one visitor as he quickly pulled back the hand he had thrust toward one fumarole alongside Highway 1, just past Lake Myvatn here in northern Iceland. The geothermal activity provides the country with much of its hot water and heating plus about one-quarter of its electricity. While nearby Greenland is mostly ice, Iceland, which hangs just below the Arctic Circle, is mostly green — at least in the summer. And Canadian “green” goes twice as far as it used to, thanks to Iceland’s economic problems, which cut the currency value in half. Iceland attractions revolve mainly around nature. The vast treeless landscapes are truly spectacular. Lava fields in various stages of disintegration dominate large parts of the country. Mountains, including volcanoes, rise steeply from the valleys. The ocean is never far away and along with the many lakes, attracts abundant birdlife. Because of the fire below, you can bathe in large outdoor spa pools like the Blue Lagoon and the five-year-old Myvatn Nature Baths whose opening is sometimes delayed while the super-heated water is cooled to a tolerable 40 C.
The volcanic nature of Iceland is very evident. Eruptions are so prevalent (30 volcanoes have erupted over the past two centuries) the phonebook’s “how to cope with natural disasters” section includes detailed instructions on the best way to survive a volcanic eruption. occurred in 2000 and 1996. The worldwide economic crisis forced overextended Iceland into bankruptcy. The exchange rate doubled in favour of foreign currencies. Some prices have risen because Iceland has to import so many items, but prices for foreign visitors generally have fallen to half of their former very expensive levels. Keflavik sits on Iceland’s southwest tip, the Reykjanes peninsula, which offers a taste in miniature of many of the country’s attractions: golfing, deep sea fishing, the lava fields including the Mid-Atlantic Ridge where the North American and Eurasian tectonic plates are moving apart at 2.5 centimetres a year, a replica of the Viking ship Islendingur (Vikings first settled in Iceland in 874) and the Blue Lagoon; see www.visitreykjanes.com. Reykjavik, the world’s most northerly capital city, is a 45-minute drive north on a mostly four-lane highway. Keep an eye out for the irreverent but informative Reykjavik Grapevine, which recently published The Best of Reykjavik 2009, including “Best place to cheer up (the petting zoo),” “Best biking tour,” “Best place to shop for touristy stuff (Handprjonasambandio)” and “Best place to hook up (Vegamot, Hresso, Dubliners)” — as well as restaurants and bars; check www.grapevine.is. Also, more Icelanders are holidaying at home, so booking accommodation ahead is important. A paved ring road runs about 1,400 kilometres around Iceland, past picturesque waterfalls and rivers, as well as farmhouses and churches set along the shore or up into the mountains. By the middle of the short summer — similar to that of Canada’s North — large rolled hay bales, covered in white plastic, start showing up in the fields, along with sheep and cows and the sturdy, short (1.3-metre high) and mild mannered Icelandic horses, whose special running walk is so smooth the rider hardly notices the motion (they are also raised for their meat). * The easy, one-day Golden Circle tour just to the east of Reykjavik includes Geysir (and its Strokkur geyser which shoots water and steam 30 metres into the air every few minutes), the Gullfoss waterfall and Thingvellir National Park with moonlike landscapes and another section of the ever-widening Mid-Atlantic Ridge. For delicious, fresh, local food and the most amazing chocolate mousse with raspberry puree and watermelon pieces, plan a lunch or dinner stop at Lindin restaurant, in Laugarvatn. * Drive north to Borgarnes where the Settlement Centre provides a fascinating history of how and where the Vikings settled in Iceland starting in the 10th century. * Hvammstangi features the Icelandic Seal Centre, an Icelandic wool-knitting factory and shop, and nearby Gauksmyri Lodge, with horseback riding, hiking, birdwatching, yoga and Bowen therapy. * Lake Myvatn is surrounded by lava fields, craters, bubbling mud pots, steaming fumaroles and otherworldly landscapes as well tranquil countryside for hiking, cycling and climbing. * Credit cards are widely accepted; service is included so you don’t need to tip. Hotel room rates often include breakfast. Camping offers an inexpensive alternative. Most people speak English. * Long daylight hours in summer allow you to make the most of your visit. Is global warming linked to volcanic eruptions? A team of geologists is trying to gather data in an attempt to understand how global warming will increase the explosiveness of volcanic eruptions. As increasing atmospheric carbon dioxide levels warm the planet, the problems associated with melting ice won’t just raise sea-levels; they will also uncap volcanoes. But just when and how these unstable magmatic beasts will blow in a warmer world is hard to predict. “The fact is we are causing future contemporary climate change. Geological hazards are another portfolio of things we haven’t thought of,” Bill McGuire from the Aon Benfield UCL Hazard Research Centre at University College London told Nature News. He organized a meeting of volcanologists and oceanographers at the university on September 15-17 to draw attention to the problem. A priority is to develop global models of how changes in the climate bring about changes in geological activity, and how those processes feed back into the system. At present, such models just don’t exist, according to David Pyle, a volcano expert from the University of Oxford, UK, who spoke at the meeting. “As thick ice is getting thinner, there may be an increase in the explosivity of eruptions,” he said. The problem is complex, exacerbated by the difficulty of separating forcing by the climate from the effects of a volcanic eruption - aerosols emitted by an eruption will have consequences for atmospheric chemistry, which in turn affect the climate. “The complex consequences of volcanic activity for the atmospheric biosphere remain poorly understood,” Pyle said. But there is definitely some evidence that less ice means more dramatic eruptions. “As thick ice is getting thinner, there may be an increase in the explosivity of eruptions,” said Hugh Tuffen from Lancaster University, UK. A team of geologists and geophysicists dispatched to Northeast Ethiopia, where volcano has recently erupted, confirmed that the eruption caused surface displacement in the area. The volcano has recently occurred in the area located at 65-kms northwest of Semera, capital of Afar regional state. Geologists drawn from Institute of Geophysics, Space Sciences, Astronomy and Earth Science Department of the Addis Ababa University, Universites of Cambridge and Oxford told ENA over the weekend that the volcano, which occurred on June 29th , 2009, has created about 4.5-kms opening within a 60-km-long dyke created in the area in 2005. According to the geologists, the 2-meter wide dyke has extended from Dabbahu to Harraro areas. With the expectation of more volcanic events in the region, Dabbahu-Manda-Hararo is the most active area on the planet right now, they said. Assistant Professor at the Institute of Geophysics, Space Sciences, and Astronomy of the Addis Ababa University, Dr. Elias Lewi said that number of volcano incidents happened in the area since 2005. Most of the volcanic eruptions that occurred in the region remained beneath the surface of the earth, he said, adding, the recent one is the fourth eruption in Ethiopia since 2005. According to him, the eruption was a follow-up to the dyke created due to similar eruption four years ago . The recent volcano covering 4.5 square kilometers has also created small hills elevated from 30 to 40 meters. Associate professor at the institute, Dr. Tesfaye Kidane on his part said lava has overflowed from the dyke that covers 5-kms long and surface displacement occurred following the eruption. He said that bigger eruptions and earth quakes are expected to happen in the next five years. The geologists urged responsible bodies in the region to consider the issue in any of development activities being undertaken in the area. Taal volcanic activity has tourists kicked off island! Tourists were ordered off an island volcano near the Philippine capital on Tuesday after seismologists detected ground shaking that they said could presage a minor eruption. "Significant volcanic and seismic events have been detected over the past months" and the main crater of Taal "remains off limits to the public because steam explosions may suddenly occur or high concentrations of toxic gases may accumulate," an official advisory said. The tiny crater island is surrounded by a lake that formed from a past eruption. Scores of visitors cross the lake by boat every day before making a short day hike to the 311-metre (1,020-foot) high crater lip. Mayon volcano, a touristic attraction! ALBAY - Despite stern warnings from disaster officials in Albay of a possible Mayon volcano eruption, foreign and local tourists on Wednesday still flocked to areas that have been declared as danger zones. The tourists, some of whom were from Switzerland, were seen visiting the Mayon Planetarium and Science Park in Buang in Tabaco City, just 3 kilometers away from the volcano's crater. The planetarium is known as the "Little Baguio" (the summer capital of the Philippines) in Albay because of the cool weather. Several volcanologists have noted that it is harmful to stay in the area since a sudden volcanic eruption is possible. Despite the risk, tour groups still enjoyed taking pictures of the newr-perfect-cone-shaped volcano. "The place is amazing. So there is no reason not to come here. And I saw many people coming around, so there's no reason for us to be afraid," said Raphael Perruchoud, a Swiss tourist, in an interview with ABS-CBN. The Philippine Institute of Volcanology and Seismology (PHIVOLCS) warned, however, that a 6-kilometer perimeter around the volcano has been declared a permanent danger zone and should be off-limits to any human activity. The provincial government of Albay had supposedly halted tourism-related activities within the danger zone, including the trek to the Mayon Planetarium. Disaster teams sent by the local government are set to meet to discuss how to prevent tourists from entering the planetarium grounds. Members of Albay's Public Safety and Emergency Management Service Office (APSEMO) said it would be better if they put up warning signs around the danger zone. For the past 24 hours, PHIVOLCS recorded 5 short-duration tremors and observed crater glow in the evenings, which indicate sustained magma activity inside the volcano. Residents living on the volcano's foot have also reported strange animal behavior, possibly indicating an impending eruption. They reportedly observed an increasing number of snakes and wild pigs descending from the volcano's slopes. Ed Laguerta, PHIVOLCS resident volcanologist, said wild animals are sensitive to their environment and instinctively look for safety when sensing harm. He said the animals might be feeling the increased temperatures on the volcano's rim, prompting them to move away. PHIVOLCS officials, however, have yet to release an official statement on this matter. Report by Jose Carretero, ABS-CBN Bicol. Mayon erupting in August 2004. The increasing unrest at Mayon in the Philippines has prompted National Disaster Coordinating Council (NDCC) to recommend the evacuation of over 75,000 people> from around the volcano. This, however, will only happen if the activity at the volcano continues to increase. The volcano currently sits at Alert Level 2 (increasing unrest) and if it were to increase to Level 3 (increased tendency towards eruption), then the evacuations of the first ~1,800 families closest to the volcano would begin. Only if the volcano reached Alert Level 4 (hazardous eruption imminent) would the full evacuation of the 75,000 people in the "High Risk Zone" that extends 8 kilometer / 5 miles around the main crater area. Centers are currently being set up to accommodate some of the evacuees. Of course, there are always people who don't want to heed the warnings of the authorities and Mayon is no exception. Upwards of 6,000 people living within 6 kilometers / 3.7 miles of the volcano have so far refused to evacuated the government-designated "no man's land" close to Mayon. Many of the residents are farmers who were relocated from the area but continue to return. The area around Mayon are quite fertile thanks, in part, to the volcano material deposited on its slopes - and people don't want to leave their home if its not necessary. This has been an ongoing struggle between local residents and officials about evacuating/relocating but the importance of maintaining a buffer around the volcano was highlighted in 1993 when 80 people near Lepazgi City were killed by an unforeseen eruption of the volcano. However, there are no indications that local officials will forcibly remove people (at this point at least). PHIVOLC plans to measure the sulfur dioxide emissions from Mayon in the next few days. Seimicity has increased to the levels of the August 2008 phreatic eruption of the volcano and the levels of inflation of the edifice (0.4-1 cm) have been sustained over the weekend. The last major eruption of Mayon was in 2006.